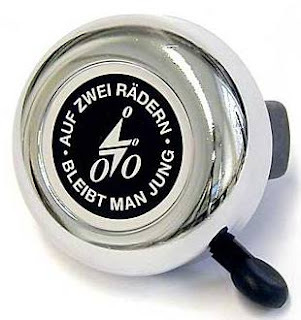 No I did not learn to speak German overnight....this phrase, Auf zwei Rädern bleibt man jung (On two wheels you will stay young), was sent to me by a fellow blogger and Mundo rider in Deutschland (thanks Stefan!). He originally sent it to me in response to a post I wrote recently on aging and bicycling (click here to read it). I love the positivity of the phrase. Stefan also maintains the blog, Mein Yuba Mundo (My Yuba Mundo); it's an interesting blog and I hope you pay it a visit (if you are like me, a typical American that only speaks one language, you'll find Google Translate helpful). Whether or not my zwei rädern will keep me young is in question (though it's obvious it's good exercise), but it sure is fun...and that's good enough for me. This is just the bell, I mentioned. Think I should get one.